The annual release of historical papers from roughly 30 years ago took place over the New Year in Dublin, London and Belfast. As in previous years, the release of documents has again been highly selective, with roughly one third of papers on the North remaining classified or censored for “national security” reasons. The traditional fear of the Dublin government that conflict in the North could spill over and undermine the 26 County state dominated the talks which led to the Anglo-Irish Agreement of 1985. 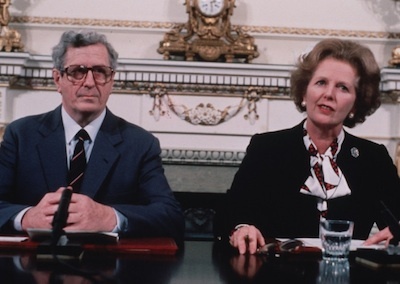 Thatcher expressed bafflement at what was really being sought by the nationalist community after the 26 County Taoiseach Garret Fitzgerald urged her to abandon ideas of Irish reunification or repartition. She also rejected Fitzgerald’s chief proposal, involving an administrative role for Dublin in the affairs of the Six Counties, because it impinged on British authority. However, she ultimately agreed to a more token “consultative” role for Dublin to bolster John Hume’s moderate nationalist SDLP and help defeat Sinn Fein. Thatcher and Fitzgerald had swapped ‘doomsday’ scenarios, with Thatcher warning of the rise of a Marxist dictatorship in the Six Counties, while Fitzgerald feared an all-Ireland civil war involving mercenaries funded by Libya. A note in the British files from Charles Powell, Thatcher’s private secretary, details how FitzGerald spoke with “considerable emotion” to insist that the government and people of the 26 Counties did not want anything to do with the North, but were forced to act because of the potential for disaster. Summarising Dublin’s position, Powell wrote that Fitzgerald wanted a deal “because he believed that otherwise Sinn Fein would gain the upper hand amongst the majority in the North and provoke a civil war which would drag the Republic down as well. “There were people on the sidelines like Colonel Gaddafi ready to put up millions of pounds to achieve this aim. Thatcher told Fitzgerald in the November 1984 talks that progress could be achieved by simply moving the border. “She wondered if a possible answer to the problem might not simply be a redrawing of boundaries,” records an official note of the top-level meeting. Fitzgerald was horrified by the idea, warning Thatcher against adding momentum to calls for Irish unity. At the summit in the runup to the 1985 Anglo-Irish Agreement, Fitzgerald said: “What we have achieved at present is a lowering of expectations”. He said most people had accepted “unity was not on”. The secret files released in Dublin’s National Archives details Thatcher’s “incomprehension” as to what exactly was sought by Irish nationalists, who she referred to as “the Irish-Irish”. But FitzGerald urged Thatcher to tackle the “alienation” of northern nationalists who felt “they had been cut off (from the rest of Ireland) by an arbitrary act”. He spoke of “bias” in the justice, security and policing systems in the North while the guns of the British Army’s Ulster Defence Regiment were being used to “bully” Catholics, and said a Dublin government Minister should work alongside the British Secretary of State in Belfast. Thatcher protested that Catholics in the North, who made up 40% of the population, “took the [British] government’s money” and that the Six County state was “ridiculously expensive”. But she accepted there was discrimination and admitted some areas - pointing to Lisburn as an example - “would not accept Catholics”. During the exchanges, Thatcher ironically warned of the consequences of creating a sectarian statelet in the North. Southall is a west London suburb with a large Asian community which was the scene of a notorious race riot just three years earlier. Thatcher insisted she could not understand why a minority would seek “particular prerogatives”, and compared the “Irish-Irish” community in the north of Ireland with Macedonians, Croats, and Serbs in Yugoslavia as “minorities who had no special rights in their countries”. On the possibility of a federal arrangement under a monarchy - Thatcher said she “had not ruled it out, even though it would be attacked by unionists as an effective repartition”. However, later that day, in an infamous press conference, Thatcher made her “Out!, Out!, Out!” declaration, when she rejected the three options which the Dublin government said it had put forward -- Irish unity, a federation or joint authority. It was later reported that FitzGerald thought her behaviour was gratuitously offensive, although he later apologised to Thatcher for his public response, saying he had given “the worst press conference of my life”. As talks continued, Thatcher sought to reassure Fitzgerald that she shared his determination to prevent Ireland coming under “hostile and tyrannical forces”. She said she understood the need for “visible measures” to “build confidence” among nationalists. This ultimately paved the way for the signing of the Anglo-Irish Agreement at Hillsborough Castle on November 15 1985. The agreement allowed Dublin a “consultative role” in the affairs of the North and civil servants from the South began working from an office in Maryfield outside Belfast. However, the conflict continued unabated, and despite an initial blaze of publicity, Fitzgerald’s government lost interest in the North to concentrate on a mounting economic crisis in the 26 Counties. While peace efforts continued, unionists and British officials slowly unpicked the agreement and ultimately forced the abandonment of the Maryfield secretariat.